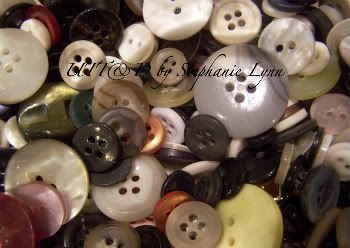 I love buttons ~ I think they are so cute. Sorting through these today I thought about how adorable they would look with some glowing candlelight peeking through the button holes. I had to make it happen…what do you think? 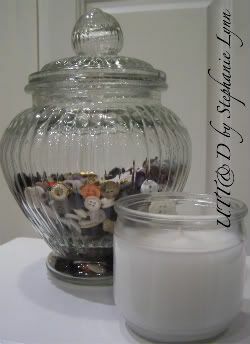 This is so simple to do and I know many of you may have a stash of extra buttons and candles making this a $0 put together. I was going to use a plain glass votive but had this glass candle I purchased from Wal-Mart (Fresh Linen Scent) for my laundry room. They run about $1.00 and once the candle burns out you can simply place a votive inside. I sorted through my buttons and picked some shades of white, pearl, and light beige. Using a handy dandy glue gun I started to attach the buttons as close as I could get them. I then went back and filled in the empty spaces by overlapping some buttons. 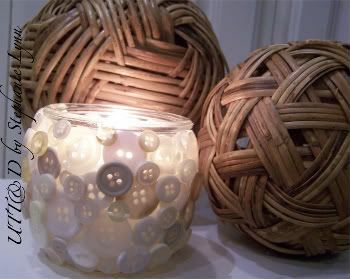 An easy way to make plain candles cute! Enjoy! I should give a thought to this idea. Thanks for sharing and have a nice weekend. I think its adorable. 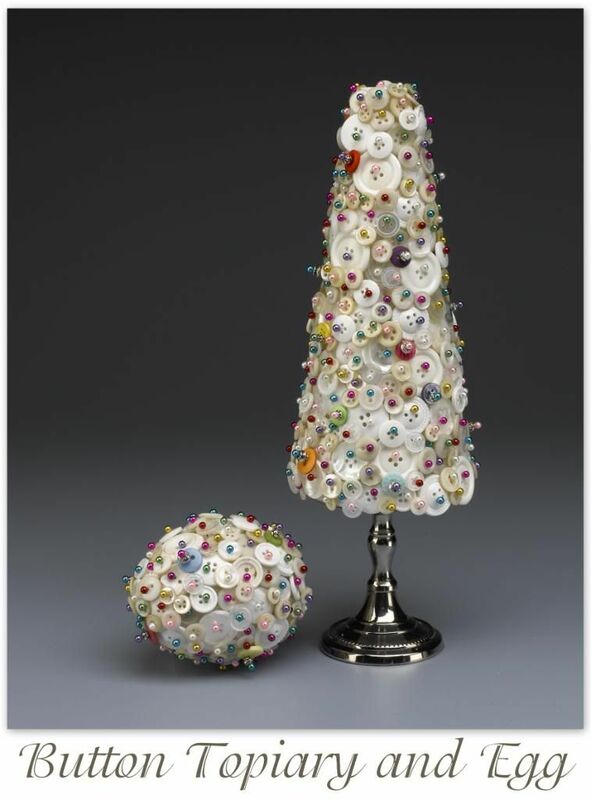 Love how crafters are starting to craft with buttons. Very cute idea. Oh my gosh…how clever this is!!! Super cute. I’m thinking a great little gift for someone who sews. Love it! Very cute! 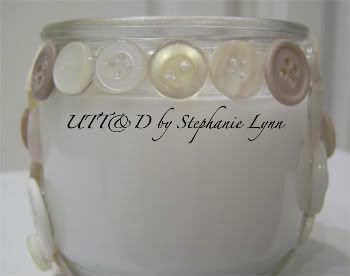 And I love that its a very cheap and easy craft! Thanks for sharing! This is a clever button idea that I haven’t seen yet. It turned out cute! I think it’s cute as a button. I’ve got a large supply of them myself and now will have to look around and get my mind going on what I should do. 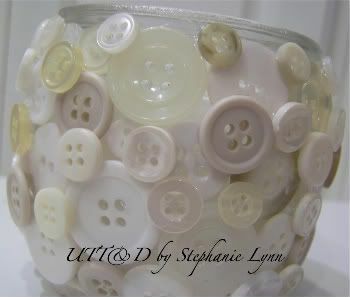 I have a jar of buttons for this very project! when the candle heats up, will the buttons fall off? That’s such a fabulous idea! Darn, I have thrown out so many of those little glass votives-I need to start saving them now! very cute idea! I too am a lover of buttons. I made a cute v-day love ball with buttons. Come and check it out. The candle holder is adorable!!! Sorry I am so late. As it ended up, we did have a (6 hour) 2AM-8Am stint in the ER with my son. Praise God, all is ok. But,it’s taken me some time to recover from being up all night. Alas, I am late in getting around to everyone this week. My apologies. I love buttons! That is so stinking cute! Oh what fun! And wouldn’t the kids love this projec too, maybe in colors that match their room! Thanks for the great idea! And for linkin’ up to FF! I love all your heart projects–don’t forget to post to my party. Your tree is so cute. I need to get all my V day decor going too–it has just been crazy since Dec 1-I think I am still trying to recover from our trip to Mo in Oct that ended up being a 3 week stay, 4 sick kids 6 visits to the emergency room–we were wiped out when the plane landed on Oct 30th. Nov was nothing but catch up and then Dec came barelling in and here we are in Jan. Maybe by May I will feel like I am back to normal. Brilliant! More than that, the colors of the buttons are so simple and pretty. Pure genius use of buttons..The effect is so cool- with or without the candles..Clever of you to come up with something like this! What a clever idea. What type of glue did you use so they would stay on? This is so pretty! 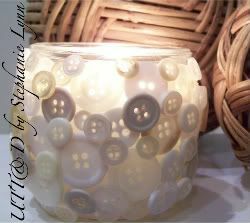 I love candles and buttons. I love buttons too! They seem to be scarce around here, but I love what you did with them and am going to start gathering them so I can do this too! Thanks for sharing it with us! I love your website. This is the first I’ve taken a look. I copied directions for you book pages birdie and want to try it in different colors. I also do crafts with buttons like brooches and clothes pin clip magnets. Your project with the votive light is beautiful, I will for sure try it. Both candle projects are so special, love them. Simple, doable, inexpensive and pretty, what more could we ask for? Always love buttons/candles/pretty beachy. Something I can afford and can do, want to make some small gifts. Have great weekend, enjoy your posts very much.